Just A Scrappin' Feb. 7th challenge Love is in the Air. Use Lots of Hearts. 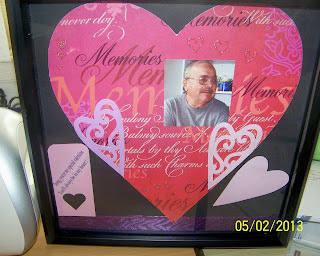 For my Love is in the Air I did a "in Memories" for the good Valentines Days my husband and I had. I cut on large heart using Cricut Art Philosophy <heart1> at 11" Me & My Big Idea 2005 print paper, then a hearts using <heart3> at 4" plain pink, and <heart 3> Layer purple pattern. I made this on black cardstock, using purple ribbon, bling hearts stickers and other scraps for my stash. I do not buy new supplies for projects except glue and tape runners. First I glued on the ribbon to the very bottom, added the main heart, cut his picture to 3" square using Elmer's adhesive squares placed that on the space next to "Memories". Next the cut hearts and then the stickers. Sherry, what a lovely shadow box for Valentine's Day. Thank you for sharing your project. Such a beautiful tribute to beautiful Love! This is such a beautiful memoir to showcase your loved one. I think you did a fantastic job with this!